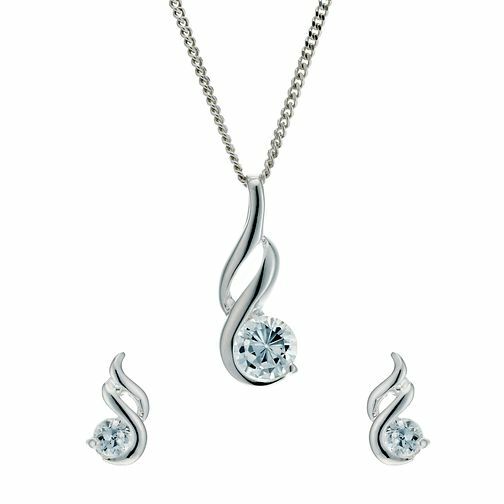 Crafted in sterling silver and featuring an elegant twist design, this earring and pendant set is finished with sparkling cubic zirconia. Perfect for the day to night transition.Pendant height: 1.7cm, Pendant width: 0.6cm; Earring height: 0.9cm, Earring width: 0.5cm. Sterling Silver Cubic Zirconia Earrings & Pendant Set is rated 4.7 out of 5 by 10. Rated 5 out of 5 by Anonymous from Beautiful set Bought as a present, beautiful set and perfect to wear at any time. Rated 5 out of 5 by Anonymous from Excellent value Beautiful and delicate, looks amazing on. I have recieved a lot of compliments, I am so pleased with this purchase.